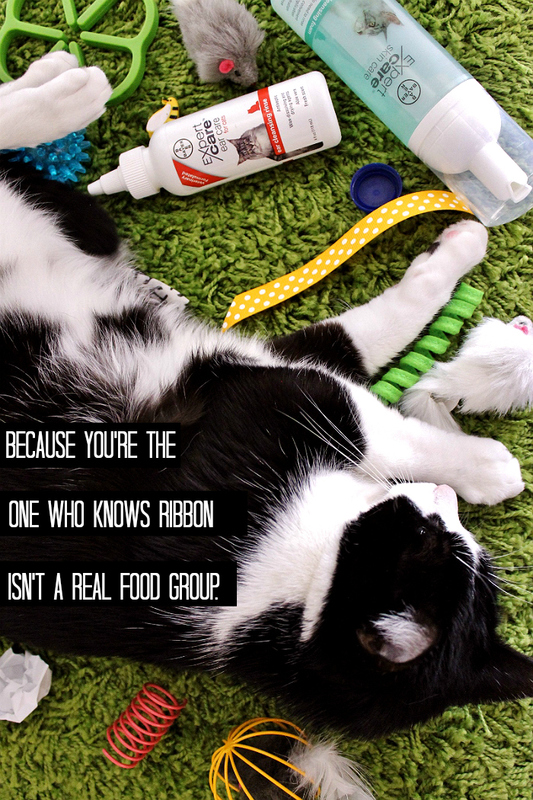 Momma Told Me: String is not a toy. I love my cat, I do. But she is not the best authority when it comes to her own well being and care. When pets are puppies and kittens special attention is given to them through the course of vaccinations and potty training. We meticulously screen and treat for fleas, encourage good behavior with rewards and obedience training, and even experience scenarios similar to 'second child' human parenting. For example, when Truffles was a kitten I would have never dared leave her home alone with access to rooms where small items were left out. And goodness knows I'd have had a minor heart attack if I saw her walk by with a piece of ribbon in her mouth. But, today, some years later, I've learned not to sweat the small things. After all, cats will be cats. And, much like human parenting, pets require constant health and physical care throughout their lives. Regular vet visits don't just stop because the puppy stage is over and all of the scheduled vaccines are current. Too often do I hear tales of my friends and family bringing a beloved fur-child into the vet for what turns out to be an issue that could have been caught, and even treated sooner. As adorable as their voices are, pet's cannot always clearly communicate to us their physical needs. After all, Truffles is the one walking around with the ribbon hanging from her mouth; I wouldn't take her word as to what's 'normal' or not. Just like you likely moisturize your skin after shaving, or exposure to extreme and harsh weather, or how you take a probiotic to encourage healthy digestion, pets require nurturing and care that goes beyond walks and full food bowls. That's why we shop at PetSmart, where we can browse a variety of health and wellness products for all of our furry children. Not only are the associated on hand welcoming and eager to answer any questions, Nora gets to help pick out gifts for her big sister. I don't think that sweater will go over too well with Truffles though! 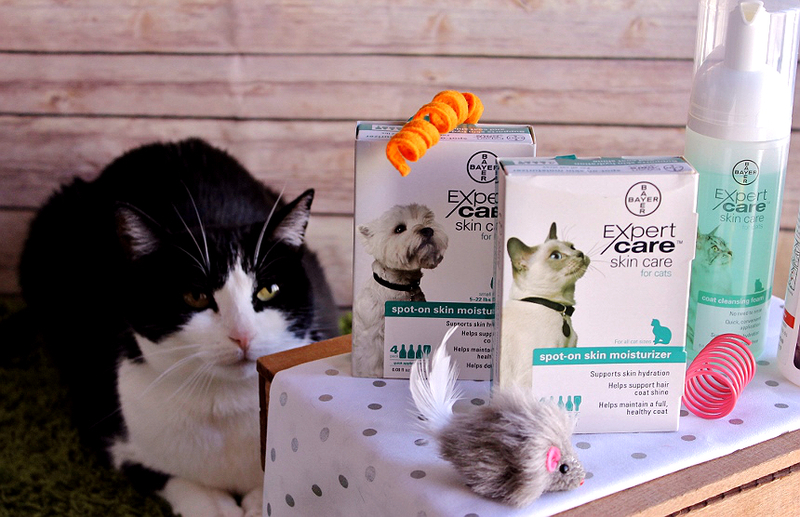 Bayer® ExpertCare™ product range spans feline and canine product ranges with gentle and safe formulations for fuss free use. With the Winter coming up, shedding will surely be turning to dry skin- so we've already begun treating Truffles with the Bayer® ExpertCare™ Spot-On Skin Moisturizer. If you've noticed a duller coat, itching, or flaking, this has worked wonders to solve some of these issues for us! The Bayer® ExpertCare™ Spot-On Skin Moisturizer includes 4 applications of a fatty acid rich formulation that goes on just like modern flea or tick prevention treatments. Simply part the fur at the nape of your cat's neck and apple the pipette. Repeat weekly for 2 months, then bi weekly for as long as needed. 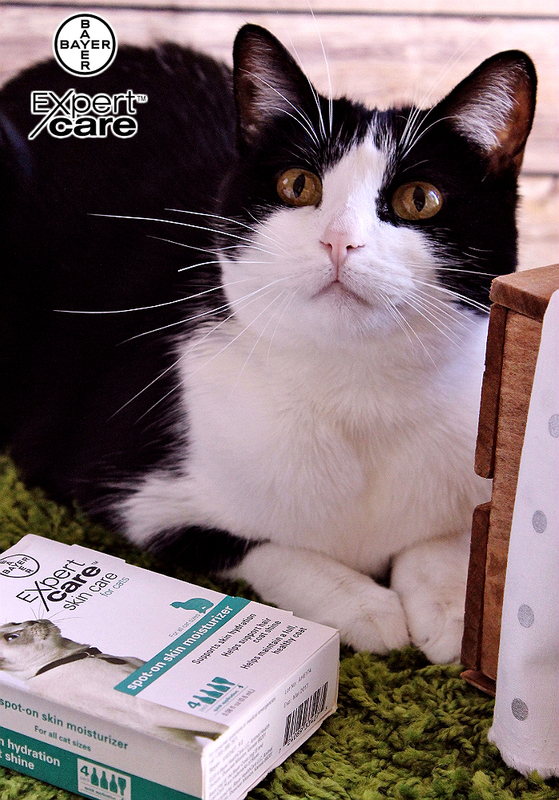 You should expect to see a change in your cat's coat as soon as a week, as their skin absorbs and hydrates naturally. I'll admit, Truffles usually has a little bit of a 'gelled' look on her nape for several days, but this eventually settles, and the impact on her coat and skin has been noticeable. We've seen a lot less scratching and flaking! 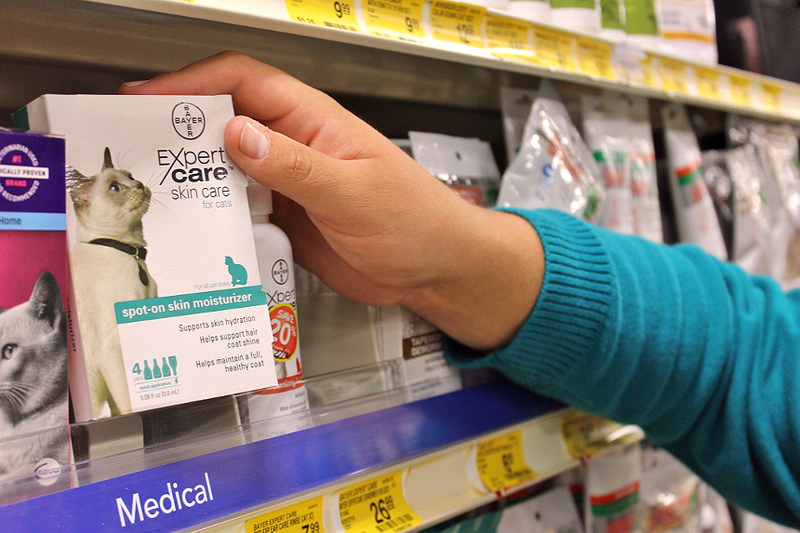 Look for Bayer® ExpertCare™ Spot-On Skin Moisturizer for dogs too! Taking care of you pet's skin and coat between baths is just as important as brushing your own hair and choosing the right beauty products. If you see dandruff on your shoulders you'll switch shampoos, right? Don't let your pets walk around with dry, irritated, skin! As we head into the Winter it will only get harder for coats to maintain their natural luster and shine. Or course, a healthy diet will also help! For now, though, we're not leaving it up to the the cat who considers a paper clip, a bottle cap, and a discarded grocery store receipt all things that belong in hr mouth! Maybe you've seen the impact of the weather and seasons on your pet's coat already, maybe you haven't. Regardless, it's always important to keep your pets comfort and health at the top of your mind, even when there seems to be no reason. Preventative health and wellness, as well as maintenance, can hep keep your pet looking and feeling their best. Discover the wide range of Bayer® ExpertCare™ products for pet health and wellness at PetSmart today. Now, tell me, what's one of the strangest things your pet has declared a toy? What Daughter Says: Let's face it, your pet is NOT an expert when it comes to their own health and well being. Look out for them with simple health and wellness at home care. My silly dog, Milo, is in LOVE with one of my husband's dress shoes. Just one. I am pretty sure my husband needs to go buy himself a whole new pair actually. I've never heard of a spot on moisturizer before. I think this would be much easier than trying to get fish oil into a cat. We just got a puppy, so I am not sure what his skin will look like this winter. Glad to know this is available. We have never had a cat, but I have seen so many cats that just get into everything. They crack me up sometimes. Our old dog would itch like crazy I wish I knew about this stuff before! Your cat looks like my grandmother's cat when I was little. I miss him so much. They have such unique personalities. Glad to know that there are products to help their skin. I adore your pictures! 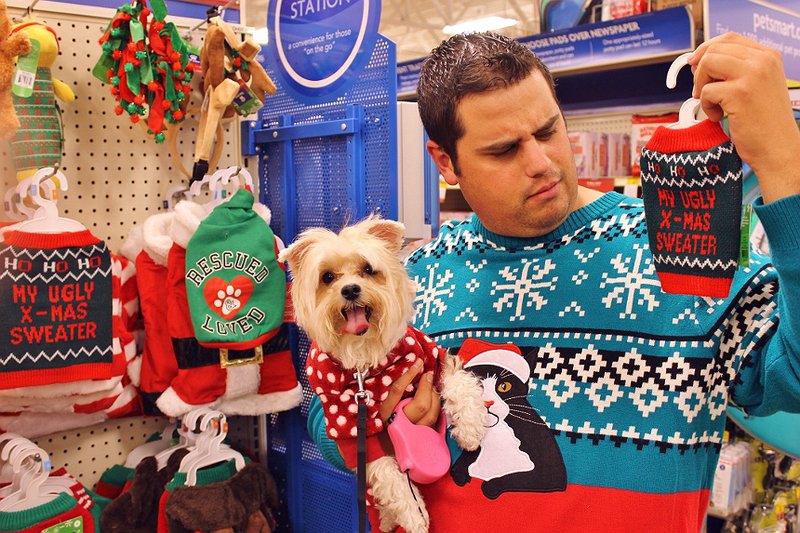 Those ugly sweaters too! I hear great things about Bayer! I may have to pick some of these up for our cat. I want to make sure her skin and coat is healthy! Your cat is so cute!!! Taking care of our pets skin is important. Some pet owners tend to forget that their skin gets dry in the winter just like ours. I don't think Truffle will like that sweater either. It is important to care for our animals, including their skin! I have heard really great things about Bayer! I have 2 cats and they love to play with things that are not cat toys. Sometimes I wonder where they kind the stuff in the house. Dogs and cats both tend to scratch when their skin gets dry during winter. 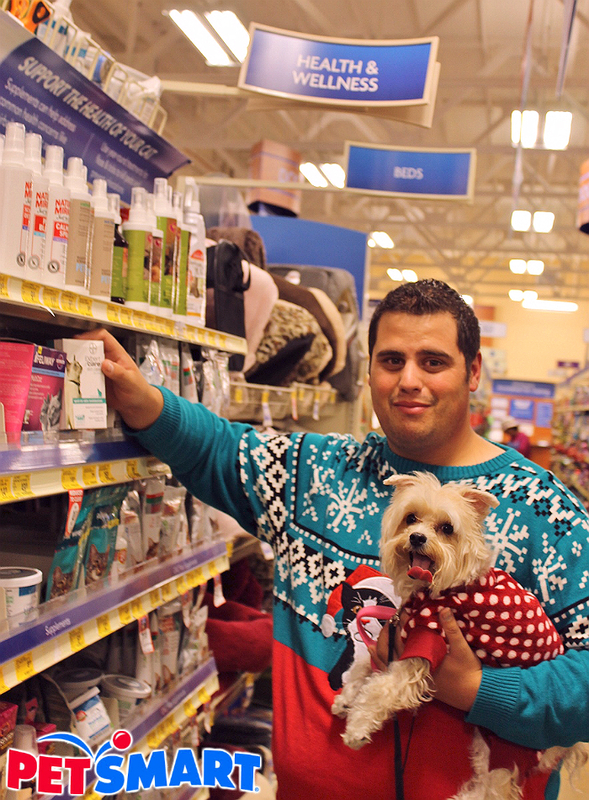 Glad to see there are some products out there that will help take better care of our pets during the cold months ahead. I need to try this. One of my dogs is suffering from itchy skin. I hope this works for him. First of all, Jeremiah is so funny. Second of all, Truffles is so beautiful! Our animals have often declared rugs and old coats as their favorite thing. They like to lay on them. 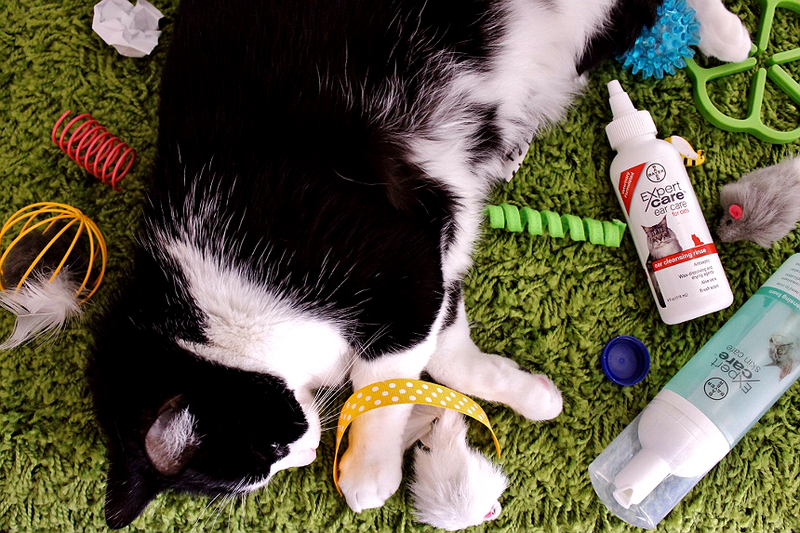 Pets can be so much fun to play with, but you've got to return the favor and take care of their well-being! My dog has chronic dry eye and I've spent so much money at the vet's trying to find something that works. This truly is a great eye lubricant. It's not super thick like the oil I get from the vet, but it's not thin like water either. The consistency is just right and the lubricant keeps his eye moist longer than any other brand I've tried.